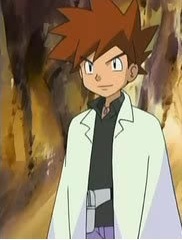 Bio: Gary, the grandson of renowned Pokémon Researcher, Professor Oak, has had a life long rivaly with Ash Ketchum. Gary has always had it in for Ash. Gary started off as an extremely arrogant kid who somehow managed to amass a group of Cheerleaders, cheering only for Gary. After he lost in the Pokémon League, Gary ditched the cheerleaders and after some soul searching, started to become less arrogant and more of a compotent Pokémon Trainer. Finally, after his defeat against Ash, Gary, with humility, mended the fences with Ash finally and decided to stop being a Pokémon Trainer and instead to follow in his grandfather's footsteps and become a Pokémon Researcher. *He show's the registered Pokegear to the trainer* And that's all you have to do. Oh look at the time! I have a meeting to go to! If you have any questions you're free to use my computer to message a man named K.Dracone to offer you more help if needed! Bio: Lance Star has been an exceptionally formidable opponent to all who has faced him even when he first started out being a Pokemon Trainer. After beating every trainer, gym leader, and the Pokemon League without having one loss Lance decided to set out to Kanto, Johto, Hoenn, and the Unova region to accomplish the same feat. Which he did. This however, caused Lance to grow extremely prideful and arrogant. He see's everyone who consider themselves a Pokemon Trainer as people who waste their time and their own pokemon's time because they won't amount to anything. Though Lance has these negative traits it doesn't make him such a negative person at heart. Because of his accomplishment at beating every trainer possible in the world (or so they thought) Lance was given the title Pokemon Virtuoso. He lives his life quietly with his famed 6 Pokemon. 5 of which have been there since the beginning of his journey. It is assumed that he'd be famous and well-known but Lance refused to be part of any media or news coverage. Because of his title "Pokemon Virtuoso" he is an extremely wealthy person. He carries a back pack with him at all times. It's filled with nearly everything you could ever need, among some things you don't. His clothes are nothing extravagant. His only wish is to see the world in a perfect harmony. He lives life to the fullest and tries not to be cautious. He has spend most of life just spending time with Pokemon. He has been to most of the regions around , due to his job. Being an uprising star in the Ranger business he was sent around to train and "inspire" fellow recruits and rookies. He keeps to himself, and has never trained or battled with pokemon till three years ago. It happened when we he heard of the Star Child. His dream is now to show him he isn't the only who can be the very best. His house actually has three rooms , not like most of the houses where some of the trainers mothers are forced to sleep in the kitchen. Animals : He can befriend animals almost instantly , it's a natural gift for him. Bio: Draco is the grandson of the Hoenn Elite Four member, Drake. Raised since birth to be a master of dragon pokemon, Draco has an innate connection will all dragon and dragon like pokemon. His dream is to surpass the top 3 dragon trainers in the world and become a true master of dragon pokemon including some of the legendary dragons. Personality: He can be quite cold and distant to others but is willing to sacrifice alot for those he is close to. He doesn't like being humiliated and can be very stubborn at times. Pokemon Profession: heiress to Poke Med. Corp.
Bio: All she’s known is the great marble pillars and stone layered walls of grand estates. Being the heiress to a multi-trillion dollar company has its perks you have every security measures in place to make sure your not kidnapped for ransom. Of course, it takes cunning and a certain level of craft to be able to bypass all these measures in order to find the right amount of normalcy to stay sane. She’s always been attentive and obedient to her parents instruction, only ignoring the fact that they want her to stay out of the woods. She was always allured to the quiet solace of the forest and the comfort of the Pokemon that reside there. Her parent’s do find her attachment to dark Pokemon quite disturbing, never really understanding her fascination. They were just like her, misunderstood and kept out of the sight of people. Personality: Palis is very stubborn, from many years of getting her way. That of course does not mean she won’t listen to reason. She mostly stays quiet, rarely smiling to anyone but her Pokemon. She is very knowledgeable about all things concerning the health and well-being of Pokemon. She does not fare well in groups of people she does not know and is often struck with irrational fear. She loves the outdoors and almost seems to take on a calmer demeanor when she is able to be close to nature. Other: Her last name is no coincidence. Bio: Miyuki is a pokemon nurse with long beautiful blue hair and emerald eye"s she travels around the regions searching for pokemon in need of help! she travels with her best friends Delcatty and lenoone, and never leaves there side. she allways meets new friends along the way as they travel along with her. but soon they all split up and go there own ways... as she is traveling alone with her 2 best pokemon friends now i wonder who she will meet in this new pokemon journey. personality: miyuki is a happy person, she is nice and never lets anyone down! when she puts her mind to somthing she never gives up untle the job is done! she cares about all her friends and pokemon and will do anything to help them. she is also very clumsy and shy but also loves to smile no matter what. she never shows her true feelings somtimes as she hides if she is sad or depressed. Bio: Having being born into a limited environment, Hanashi wishes to do nothing more than to explore. Although being a bit out there, she wishes for a peaceful life, wanting to be the top coordinator and winning lots of ribbons. A strong-willed person, she will do anything to win; although sometimes she can come along a little harshly. Adventure. That's all it really was for everyone right? and how tough it is to get a break out there when there are no clinics for miles. creating medicines and serving the travelers with home made kits and travel bags. It was nice for a while, but it proved to grow a bit frustrating. You were always the listener, but never the one with any stories to tell. Maxx personally was always the kind of girl who couldn't be tied down. battling with the Big Dogs. Finally, she approached her parents and laid it on em'. beneficial for the Trainers out there. It was a bit unfair, but it was better than not going at all. She also has her rare girly sweet moments. Classification: Pokemon Trainer/Coordinator also is training to become a Pokemon healer. Accessory: The pokeball necklace has a unique ability. With the help of her genius best friend, it has the best technology. Find out later what it is. Personality: Aria is a kind and gentle soul, who wouldn’t harm a fly unless she was provoked or a Pokemon was hurt or being harmed. 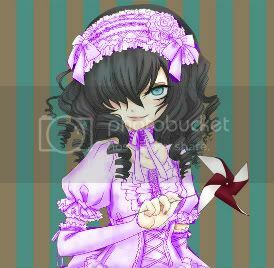 Though Aria does have a temper if someone is being very rude, but this is rarely. She is very naïve and innocent, in dire situations she is not though. Aria will befriend anyone, who shows respect to her and has a well rounded aura. Special power: Able to sense aura around her and she has unusual healing ability. Bio: Aria is use to be a small town girl, until moving to the big city of Hearthome to make her dreams come true, after seeing an add from the news paper advertising Pokemon contest and another star Pokemon trainers. As a young child she was bewildered by the idea of becoming a star. Her parents were proud of her dream, and scrounged for money so they could send her to Hearthome with her aunt. Her mother was a Pokemon healer, and was very beautiful; everyone would stop to stare at her when she entered a room. A kind and gentle women, who would take in any sick or hurt Pokemon in need. Aria’s looks later on matched her mothers. Her father was a powerful Pokemon trainer, who could match anyone he would meet in battle, along with his trusty Pikachu. Unfortunately the two died, leaving Aria alone with her….ahem…‘nice aunt.’ All she wanted was to get out on her own, and after 5 years, she had finally done it. She now wanders around regions with her partner Pichu on her shoulder. Bio: Born a strong girl to a small family in Cerulean City, Alexis's parents allowed her to study Pokemon Medicine, her passion. Alexis caught and raised her growing team: Eevee, Arkanine, Marill, Medicham, and Clefable. She knows from the top of her head every healing item and berry and carries a pouch full of them. She strove hard and trained her pokemon from the age of 13 to 18. Now, she's on a journey, traveling across the land, searching far and wide for new adventures and healing pokemon in her wake.